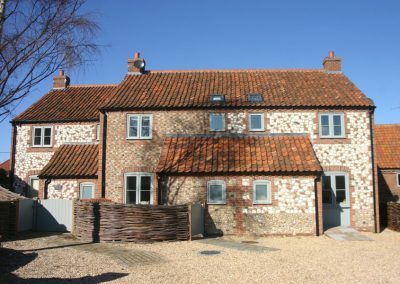 A gorgeously furnished cottage nestled in a peaceful courtyard setting in the south of the sought after village of Burnham Market. 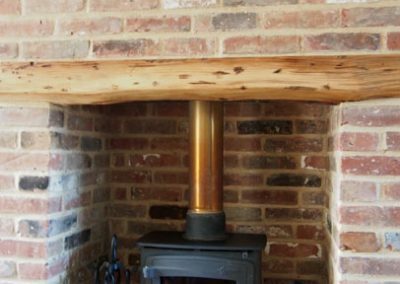 The cottage has the advantage of two private parking spaces and is only a short walk to the centre of the village, with its charming boutiques, cafes, bars and the esteemed Hoste Arms. With the natural and blue décor, you will instantly sense a feeling of calm as you step in to the open living space, and the two comfy sofas will invite you to sink in and relax at the end of your day with your four-legged friend at your feet. The kitchen is well equipped, and the L shaped living space is perfect for entertaining. 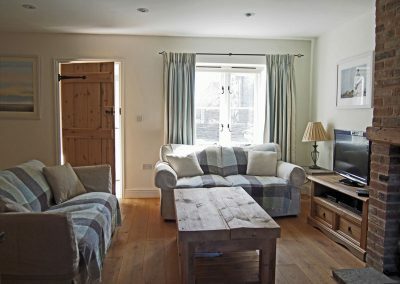 Both bedrooms are tastefully furnished and have private ensuite facilities. 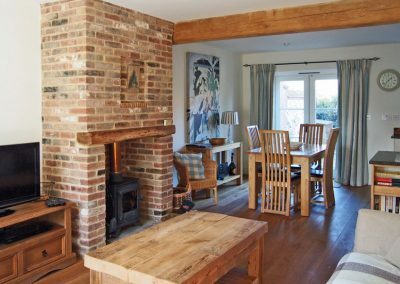 Situated next door to Plum Tree Cottage, the two could be booked for families and friends wanting to enjoy a holiday together. 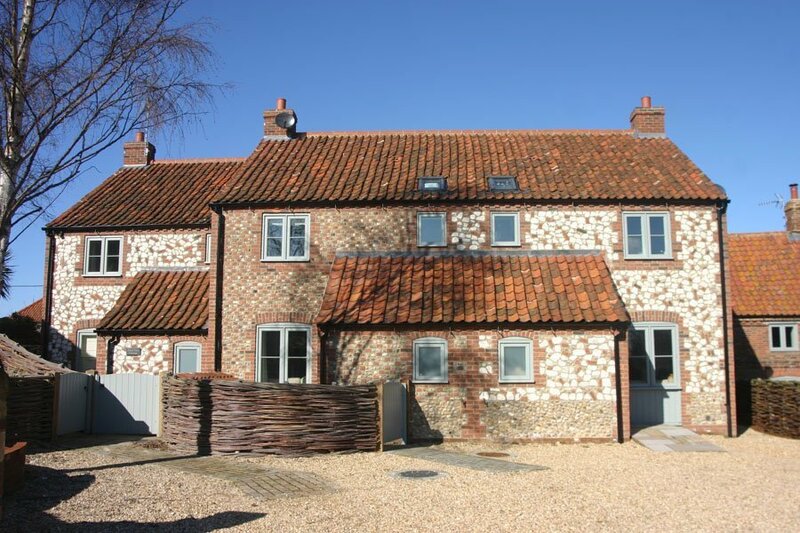 Burnham Market is only a short drive to the much-admired, wide sandy beaches of Brancaster, Holkham and Wells next the Sea, so this hideaway is the perfect base for exploring the beautiful North Norfolk coast. Shop/pub within easy walking distance. 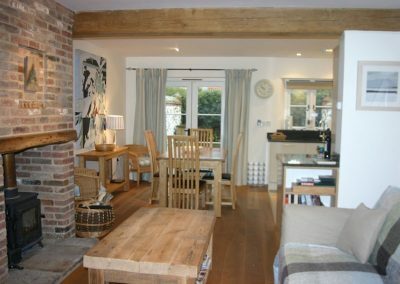 Living/Kitchen/Dining Room is an open L-shaped room with oak flooring and under-floor heating throughout. 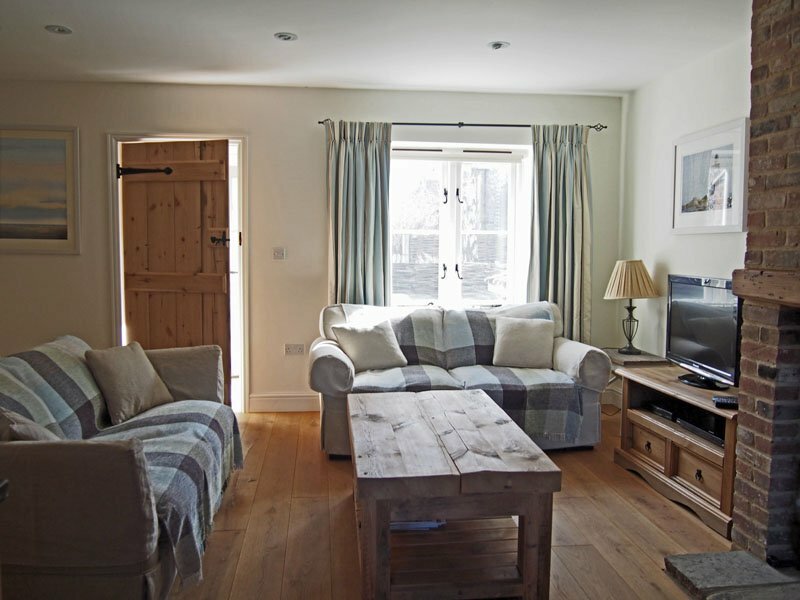 Two comfy sofas, flat screen TV with freesat, DVD player, coffee table, games, wood burner and log basket. Stairs leading to the first floor. Dining area has dining table and chairs. 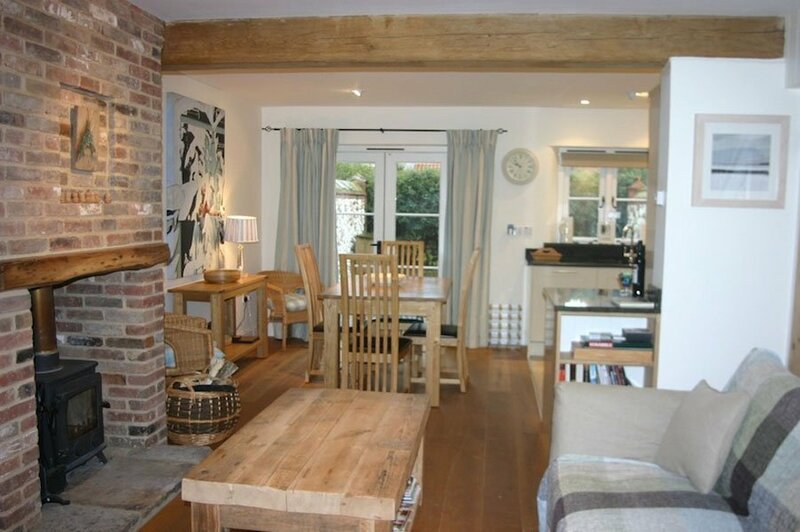 French doors to patio garden and the lined curtains make the cottage very cosy in winter. Kitchen area has tiled floor with under-floor heating, granite worktops, electric Range cooker, dishwasher, microwave, fridge freezer. Well stocked with kitchen equipment. Bedroom 1 has a King-sized bed with comfy organic mattress, bedside tables, built in wardrobe. Ensuite bathroom with shower, WC and basin. Heated towel rail. Bedroom 2 with King sized bed or split to a twin-bedded room (with 2ft 6” beds) comfy organic mattresses, Bedside tables with drawers, built in wardrobe. Ensuite bathroom with bath and hand-held shower, WC and basin. Heated towel rail, storage cupboard. Doors from the dining area lead out into the partially walled but enclosed patio garden. Metal Garden furniture with padded seat cushions. BBQ. The front garden area has a wood store and willow fencing. Travel cot, high chair and stair gate on request. (Please bring your own cot bedding). Ipod/CD player, hairdryer, ironing board and iron, garden airer. 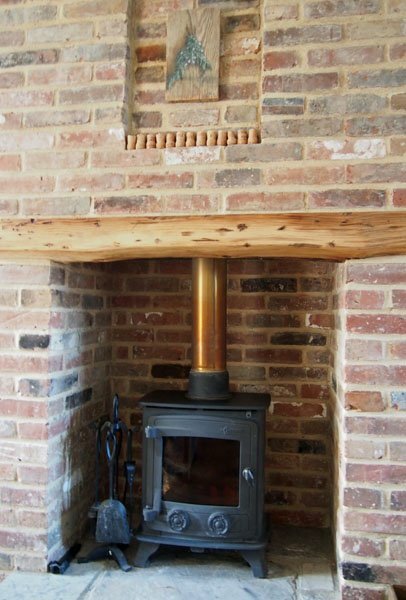 Lovely Cottage, beautifully appointed and very cosy in the evenings. We had a superb weekend, lots of coastal walks and visited some excellent restaurants and pubs. Thanks to Gilly for good administration and thanks to Carl and Louise for sharing their cottage. 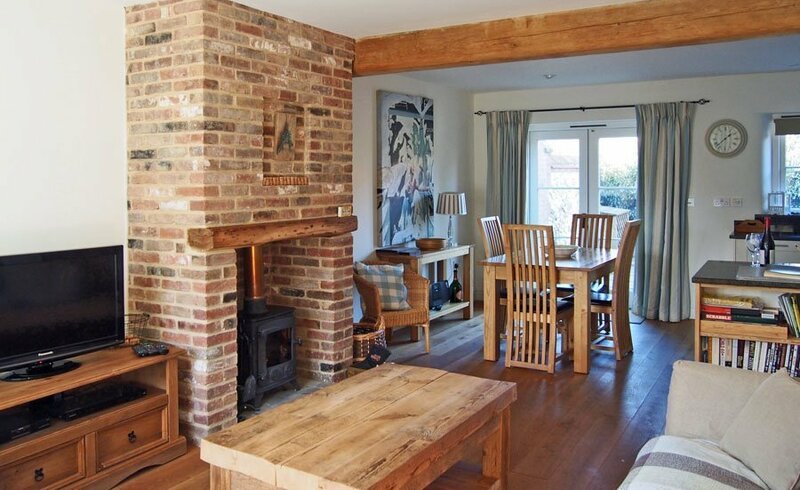 This is our 3rd visit to the charming Coopers Cottage which never fails to deliver! We have almost completed our Christmas shopping collecting unusual and beautiful gifts from the many shops of Burnham Market and Holt etc.